This delicious and indulgent chicken pot pie recipe is made from scratch with heartburn-friendly ingredients, including skinless chicken breasts and skim milk. Foods with a high-fat content are typically the culprit affecting those with heartburn. This low-fat recipe puts chicken pot pie back on the menu. Cut chicken breasts into 1-inch cubes and season with 1/2 teaspoon salt. Heat 1 tablespoon olive oil or vegetable oil in a skillet over medium-high heat. Add the 1 pound of salted chicken breast cubes and cook for 8 minutes, stirring occasionally, or until browned. Place chicken into a 3-quart baking dish, and add 1 cup frozen, thawed and drained carrots, 1 cup. In a mixing bowl combine 1 cup biscuit mix and remaining 1/2 cup of skim milk. Stir until a soft dough forms. Remove baking dish from oven and uncover. Spoon dough onto chicken and vegetables with a tablespoon and spread evenly to cover entire surface of chicken mixture. Bake uncovered for 10 minutes, or until the biscuits are golden brown. 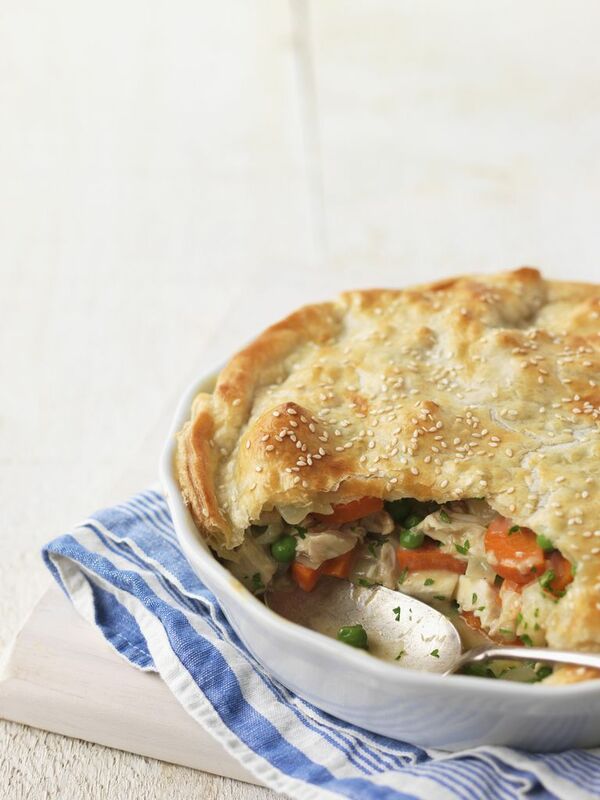 Chicken pot pie is comfort food at its best. It's the perfect vehicle for leftover roast or grilled chicken and vegetables mixed with gravy or sauce. Where one can get into trouble is the crust. Typically, high-fat pie dough or puffed pastry crusts are used, which can cause problems for heartburn sufferers. This recipe is a lighter version. Meat pot pies go back to the Roman Empire where they were served at lavish banquets, sometimes with live birds under the crust (remember "four and twenty blackbirds baked in a pie"?). 16th-century English gentry continued the custom of meat pies made with pork, lamb, game, and birds. This meat pie craze spread to the New World with early settlers who eventually took them to the West where they have become firmly entrenched in the U.S. culinary repertoire. Some say English pasties, favored by Cornish tin miners, is actually a portable version of a classic pot pie.